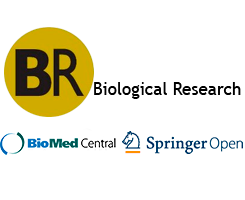 Effective January 1st, 2014, Biological Research, will be published electronically, as an "Open Access" Journal through the BioMed Central (BMC)- Springer platform. We kindly ask authors to visit our new Journal homepage at: http://www.biolres.com, the Instructions for authors at: http://www.biolres.com/authors/instructions and how to submit a manuscript at : http://www.biolres.com/manuscript. Biological Research (formerly Archivos de Biología y Medicina Experimentales) is the official journal of the Sociedad de Biología de Chile (Chilean Biology Society). This journal, founded in 1964 and renamed in 1992, is a quarterly publication that spans the broad spectrum of experimental biological research. Biological Research is an open access journal that publishes original articles and requested reviews in the diverse fields of Experimental Biology, such as Biochemistry, Cell Biology, Developmental Biology, Genetics, Genomics, Immunology, Marine Biology, Molecular Biology, Plant Biology, Physiology, Systems biology, Biomedicine and Biotechnology. Manuscripts should be presented as full length papers, short communications or reviews (as requested by the editors).